The Frog Van moves us again. In the backyard of our new home. Our new house it literally a five minute walk away from the old house and even closer to my local skatepark than I ever thought possible... you could almost say it's at the end of my street just a few houses down... almost. 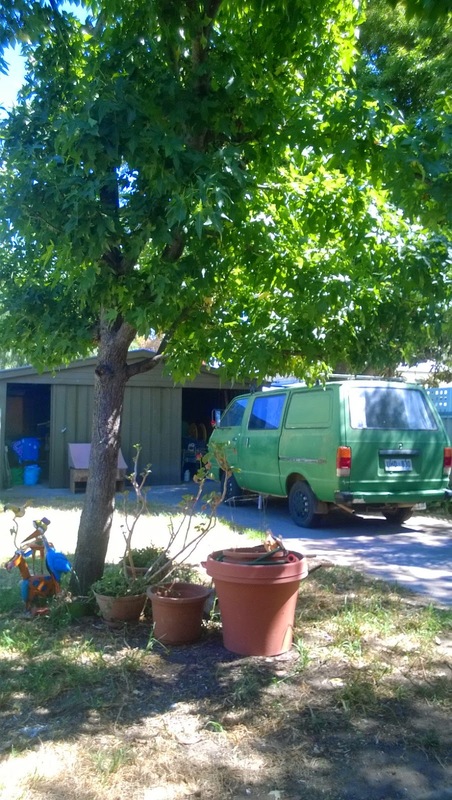 Although I haven't delivered on my GoFundMe campaign promise to use my frog van to tour more of SA and write about it (the fund was to help me get it running again), those who did help fund the van will be happy to know we used it to move everything to the new house. The second time we've done this. The first time the van died on the very last trip of the move and was off the road for quite some time after that. Pleased to report the van is still working fine as I write this. Our new house is a recently renovated, 1960's-1970's, three bedroom home with high ceilings, newly polished floorboards and a cork feature wall in the lounge that was probably all the rage back in the 70's. (Enigma hates it but I don't mind it now that we've covered much of it with a few pictures). Anyhow, our new house is surrounded by heritage homes, large trees and the last stop on our local train line. Overall it has a more homely feel than our previous home - even if the air conditioner isn't quite as effective. Now that we're kind of settled in I hope to get back to posting a blog article to both my blogs every week. Sorry if you missed me during the move.